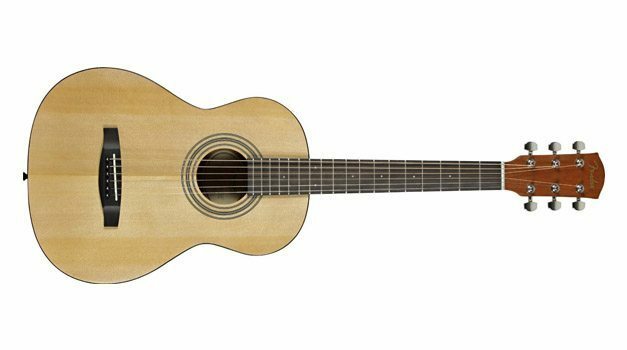 The Fender MA-1 is a 3/4 size guitar that is designed to fit more comfortably to the body for a wider range of players. Its smaller size is meant to make it a more versatile instrument, easily accessible to musicians who tend to find full sized acoustics and dreadnoughts too large. For a “miniature” guitar, and the term is used lightly in the case of the Fender MA, this guitar has a very solid feel. True to Fender’s standards, the Fender MA is well built, and it is easy to see the level of quality inspection each and every Fender instrument goes through before being shipped out of the warehouse. Unlike other smaller sized guitars, there are no corners cut with the Fender MA in terms of build quality. There is no fret buzz, or whacky fret ends present, and no divots or “holes” in the fret board, either. Natural finish on a budget instrument is usually nothing to write home about. In the case of the Fender MA, the satin coat makes the guitar feel wonderful to the touch, and the wood, while not the prime stock used on pricier instruments, looks appealing. The smaller scale length poses a few minor problems at first. Being slightly smaller, it takes a bit of time to override muscle memory and keep from fretting the actual fret wire itself. However, this is only a minor issue, and it is not a fault of the guitar; it is quite easy to overcome, especially for those who are used to standard scale guitars. The action straight out of the box is excellent for a production model guitar; it isn’t going to be perfect for every player (I myself found it a bit too high), however it is consistent across the bridge, with no dips in the bridge, and is fairly easy on the fingers. This isn’t going to be a guitar that will require an immediate trip to a guitar tech for a setup, so it’ll be easier on the wallet. Resonation is a word that is hardly ever used with a smaller sized instrument. But the Fender MA exceeds expectations in sound, with resonation in abundance, possessing a sound much larger and fuller than its smaller size would lead one to expect. This guitar sounds huge; chords ring clearly and powerfully, and notes stand out on the higher strings–a feature that is not present in most smaller sized guitars.